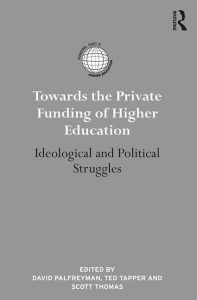 Marek Kwiek published a chapter („Robust Privateness and Publicness of Higher Education: Expansion Through Privatization in Poland”) in a book recently edited by David Palfreyman, Ted Tapper and Scott Thomas: Towards the Private Funding of Higher Education. Ideological and Political Struggles (London and New York: Routledge, 2018, pp. 90-11).